In the past, brown dwarf masses have been estimated using theoretical evolutionary models. Crepp’s team instead calculated the mass of HD 4747 B directly using observations of its orbit in an attempt to help refine brown dwarf models. 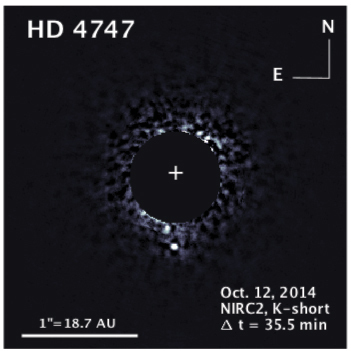 It is expected that this work will in turn help to inform models for extrasolar planets. Based on a three-dimensional orbit analysis, HD 4747 B has a mass of about 60 Jupiters (a mass of 80 Jupiters is required to ignite nuclear fusion), well below the theoretical estimate of 72 Jupiters, although still within uncertainties. Forthcoming measurements acquired by Crepp’s team will provide yet more stringent tests of the models used by astronomers for brown dwarfs. “This field is transitioning from ‘Hey, I found something neat’ to ‘Hey, I know the mass to within a few percent.’ Now, we can test theoretical models,” Crepp said. Originally published by Gene Stowe at news.nd.edu on April 06, 2016.